10 mph and 2 feet. It was blowing 20 and it kicked up to a solid 4 foot chop. After a short stop to show Shawn what it would be like on anchor at the reef, we decided to go for it and we charged forward and made our WET way to the buoy. Once we made it to the numbers we searched the screen for high relief and dropped our marker buoy on the structure. Once we had a target we drifted to get our bearings and find the heading. One, Two, Three, anchor runs to try and get a hook in the good stuff and finally we sunk the anchor deep into steel. We came tight and the depth finder was just as we expected, about 43 feet on the screen. Perfect because we knew we were in 50 feet of water. The barge that we were atop is about 7 feet of vertical relief. The first drop connected with a 4-5 lb sheepshead and soon every rod in the boat was doubled over with strong tugs and rod tips pointed towards the water. We boated a handful of convicts and sent them straight to the livewell in preparation for a great meal. 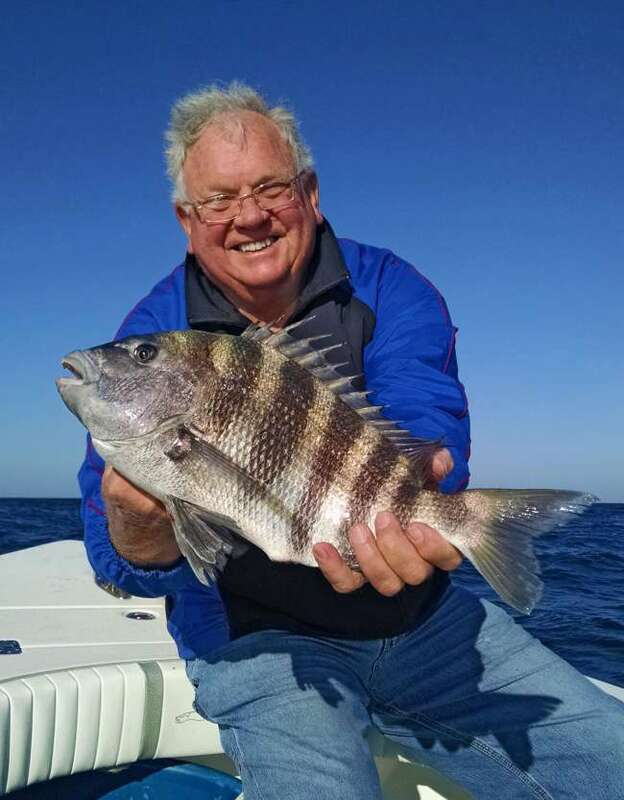 A great time was had by all, Once the waves had given us a good beating, we headed inshore to a secret spot that had us dragging smaller sheepshead, black drum, blackfish, and whiting over the rails as fast as we could bait our hooks. We managed 30-40 fish for the day including an over the slot redfish under a dock on the way home. Once again a GREAT Trip and a GREAT time with GREAT People! on your own charter fishing adventure !! Get out there and enjoy our South Carolina Outdoors!